GOMA, Democratic Republic of Congo — Congolese President Joseph Kabila was sworn in today for another five-year term by the Congolese Supreme Court in the capital of Kinshasa, amid high tensions and questions of legitimacy. Irregularities and fraud marred voting day on November 28 and the week-long count, which led a number of electoral observation missions including the Carter Center, the European Union, and the Catholic Church to deem the process unreliable. Kinshasa’s Catholic Archbishop, whose church deployed 30,000 observers across the country, recently said in public statement that the election results did not “represent truth or justice.” The Enough Project joined with other rights groups and advocates to express concern about the “growing crisis of legitimacy” while election results remain in dispute. However, Kabila ignored calls by several international organizations for a postponement of the inauguration until allegations have been addressed and the legitimate, democratic winner determined. In a strong signal from the international community, the only sitting head of state to attend the ceremony was Kabila’s longtime ally, President Robert Mugabe of Zimbabwe. However, some Western powers sent their ambassadors, under the threat of persona non-grata designation for non-attendance. Even Belgian Foreign Minister Didier Reynders, who publicly stated that he doesn’t believe the observed irregularities affected the ranking of the candidates, did not attend the ceremony, sending a diplomatic signal that more detailed answers to criticisms were expected from the Supreme Court. As a testament of the low confidence of the Congolese in their court, the judges issued their final decision without much fanfare or surprise. Only some members of the presidential majority and a handful of journalists were present in the courtroom as the results were confirmed. There was no live television or radio broadcast. 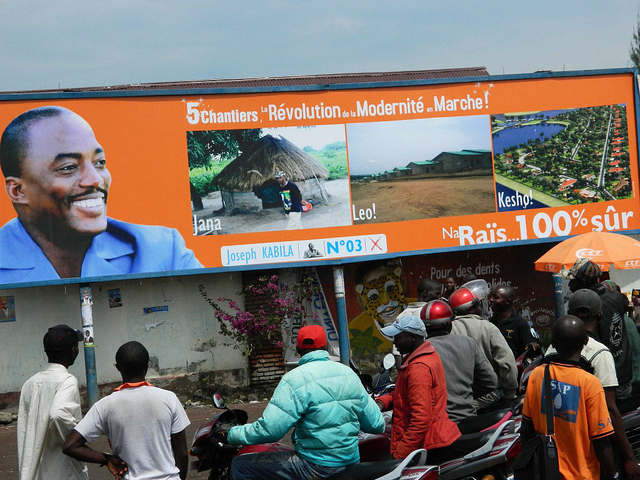 The governors of all 11 of Congo’s provinces sent congratulatory messages to the president, but with much less bombast as in 2006 when Kabila was viewed as having unified Congo. Opposition leader and presidential runner up, Etienne Tshisekedi, claims his victory was stolen but has continued to call on his supporters to remain calm. He declared himself the true president and plans to hold his own swearing-in ceremony at the national Stadium of Martyrs in Kinshasa this Friday. He called upon all ministers, provincial leaders, and the military and police to be obedient to him. He went so far as to offer a reward to whomever brings Kabila to him alive. In the meantime, local compilation centers have begun publishing the results of the legislative elections also held on November 28. Although the widespread, violent uprisings expected in reaction to the presidential election outcome have been contained so far, systematic fraud favoring the Presidential Majority in the compilation of legislative votes may add fuel to popular discontent. As one witness to the compilation process told Enough, “Forgery, trickery, corruption, electoral law violations to name a few are the daily reality in the local compilation centers across the country.” To ensure credibility of the parliamentary election outcome and to prevent the escalation of violence, mechanisms to ensure credible oversight should be put in place by the authorities immediately.